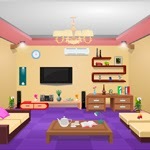 Contemporary Living Room Escape is an existing point & click room escape game. You are in contemporary living room with your family and enjoying your holiday season, but something happened and you all got locked inside. Search for clues, match items and solve puzzles to escape. Good luck!